Lieutenant Colonel George Ramsdell Lucas, U.S. Air Force retired, age 77, of Fort Walton Beach, Florida, went to be with the Lord early Monday morning, January 17, 2000, after a brief but courageous battle with cancer. Colonel Lucas was born on January 1, 1923, in New York City to the late John Garfield and Rena Murphey Lucas. He grew up in Wilmington, Delaware, in the home of his Aunt Sarah and Uncle John Krauss. He attended Tower Hill High School and the University of Delaware as a ROTC cadet. He joined the U.S. Army Air Corps in 1943 and was a B-17 co-pilot during World War II. He was also a fighter pilot in Alaska during the Korean conflict. He retired from the Air Force in 1965 from Wright Patterson Air Force Base in Dayton, Ohio, after being a part of the Aeronautical Systems Division. The Lucas family moved to Fort Walton Beach in 1966. George was employed as an electrical engineer with several defense contractors in the area, including Bell Textron, VSE and RMS. He was also very active in Shalimar United Methodist Church, serving on several committees. He also attended the mission trip to Costa Rica and was a member of the Men's Breakfast Club. George was also a member of the Order of Daedalians; Northwest Florida Retired Officers Club; Fort Walton Beach Computer Club; and Habitat for Humanity. 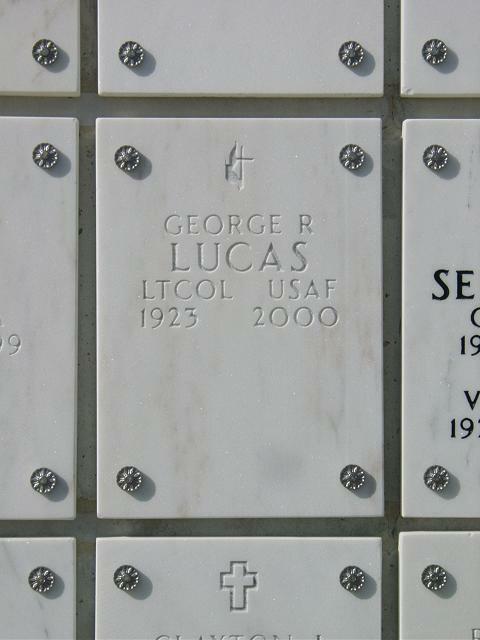 Colonel Lucas was preceded in death by his parents and his brother, John G. Lucas Jr.
George was a devoted and loving husband, father and grandfather. He is survived by his wife of 54 years, Clare B. Lucas of Fort Walton Beach; daughter, Sara L. Patterson and husband Douglas of Blacksburg, Virginia; son, Dr. George R. Lucas and wife Dr. Patricia Cooke-Lucas of Baltimore; son, James B. Lucas and wife Jo Anne of Seminole, Florida; daughter, Nancy Murie and husband Jeff of Shalimar; nine grandchildren, Cara Patterson, John Patterson, Jessica Lucas, Kimberly Lucas, Theresa Lucas, Scott Nichols, Brian Murie, Kevin Murie and Beth Murie; brother, Howard Lucas and wife Marguerite of Toronto, Canada; brother, Frank Lucas and wife Joan of Ontario, Canada; brother, Paul Lucas of Ontario; cousin, Anne Krauss Harris and husband Dr. Laird Harris of Wilmington; numerous nieces and nephews; and many other extended family and friends. At George's request, his remains will be cremated and interment will be in Arlington National Cemetery, Virginia. Memorial services will be conducted at 11 a.m. Friday, January 21, at Shalimar United ethodist Church with the Revs. John Collins and Jerry Hollis officiating. In lieu of flowers, the family requests donations be made to Shalimar United Methodist Building Fund; Daedalians Scholarship Fund; or Habitat for Humanity, in memory of George R. Lucas.